Hi Marcel...I am trying to sort out various Piotr Baginski/Bagienski individuals in my ancestry. I believe you provided me with baptismal records in the past. Will try to list...logically. Piotr(1) and Piotr(2) are the same man, with the same wife, even though their listed age varies. Piotr(4), I suspect, is the father of Piotr(3), and I suspect is the father of both Kazimierz and Michal, even though he would have been 66 years old at the time of my grandfather's birth. It would mean that Piotr(4) would have been married twice. Since all of these individuals are centered in two villages adjacent to Nur and were baptised in Nur, I assume they are all somehow related. That is my reason for wishing to obtain the baptismal record for Piotr(3). Tell me if all this makes no sense! Im not sure if i understand You. From one hand you say your grandfather had brother Michał and Jan and from the other hand You say that Jan was Your grandfathers cousin... so was he his cousin or his brother????? so, who is Piotr 3 for Piotr 1, 2 and 4?? And how is Jan bagiński related to Piotr Bagiński???? if you suggest Piotr 4 is the father of Piotr 3, so how can Piotr 3 be at the age of 29 in 1895??? You followed my mixed up explanation of the Piotrs pretty well. You asked if Jan Baginski was a cousin or a brother to my grandfather, Kazimierz. Jan lived about 50 miles north of where we lived and we visited him often in my childhood. In my family, he was always referred to as our "Uncle John." However, Michal Baginski's son informed me about ten years ago that he was actually a cousin of Kazimierz and Michal. Jan Baginski was born in 1896, his father being Piotr, aged 29. I may have confused you with another Jan Baginski, who was Piotr's brother and who acted as Jan Baginski's (b.1895) godfather. I already have the Baptismal Record for Jan b. 1895, translated by "Karol." 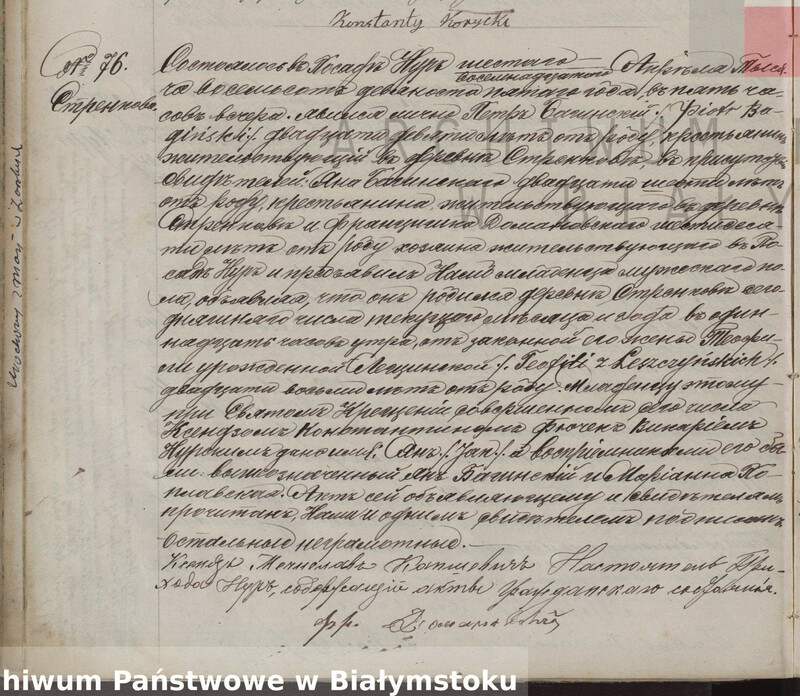 It is that document which revealed Jan's father as being Piotr Baginski, aged 29...therefore I believed born in 1867. 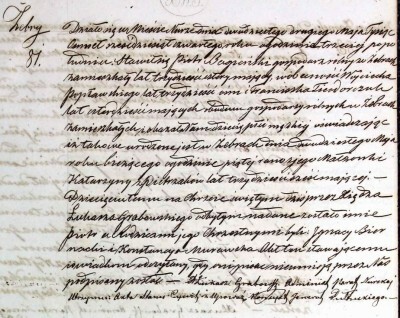 You attached the Baptismal Record for Piotr(3) b. 1864. His father was a Piotr Baginski, whom I suspect was the father of Kazimierz and Michal. I have a baptismal record for Piotr(4) b. 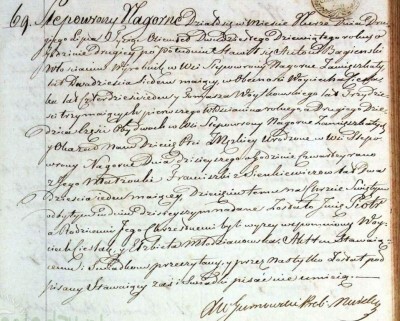 1829 in Slepowrony. If I knew the age of the father, Piotr, of the son, Piotr(3) b. 1864, I could confirm who all these guys relate. 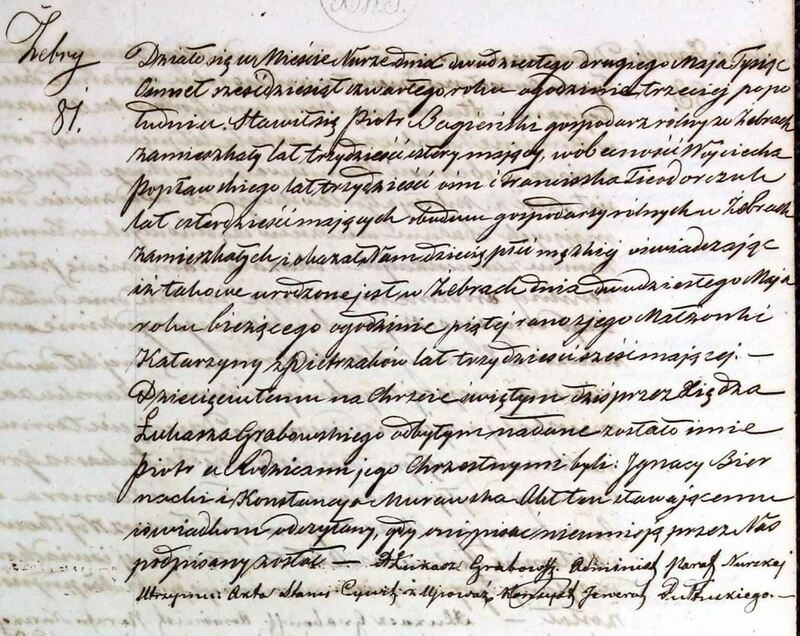 It is interesting also that the Baptismal Record for Piotr(3) b. 1864 indicates his mother as being Katarzyna Pietrzak. Michalina Pietrzak was the mother of both Kazimierz and Michal. It seems that it was just one, big, happy family. 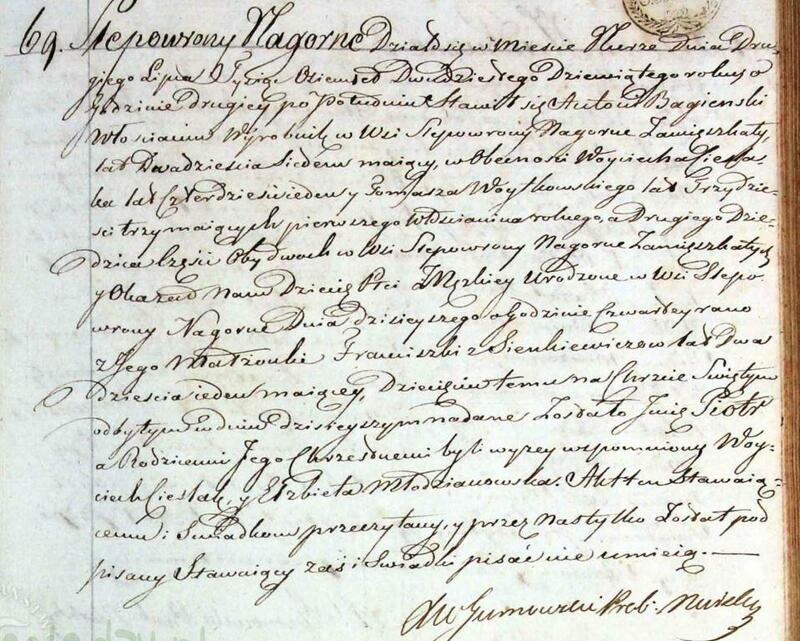 I will attach the Baptismal Record for Jan Baginski b. 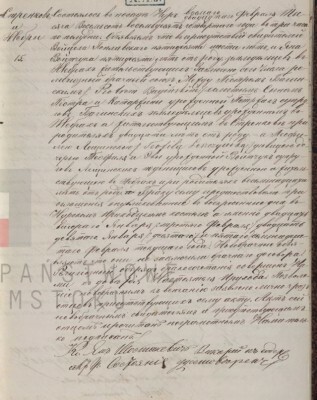 1895, Will also attach a Baptismal Record for a Piotr(4) b. 1829 whom I suspect is the common ancestor of all these family members. 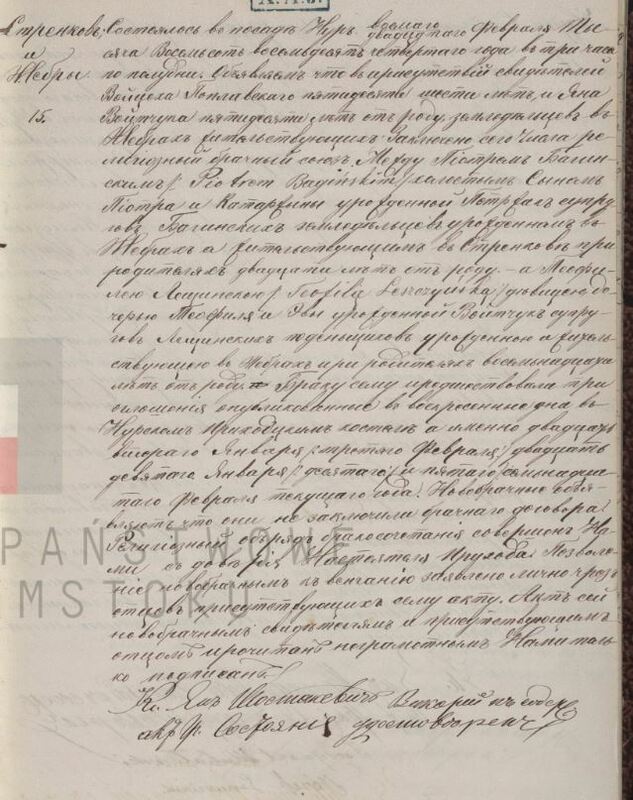 I would like a translation of the Baptismal and Marriage records for Piotr(3) b. 1864 that you attached. They should help me identify the relationship of all these people. I appreciate the effort you have made on my behalf, Marcel. I would like to pay you a stipend but have no idea what might be a fair amount. Would you tell me an amount of US dollars that you would consider fair for the time you have spent on my family records? 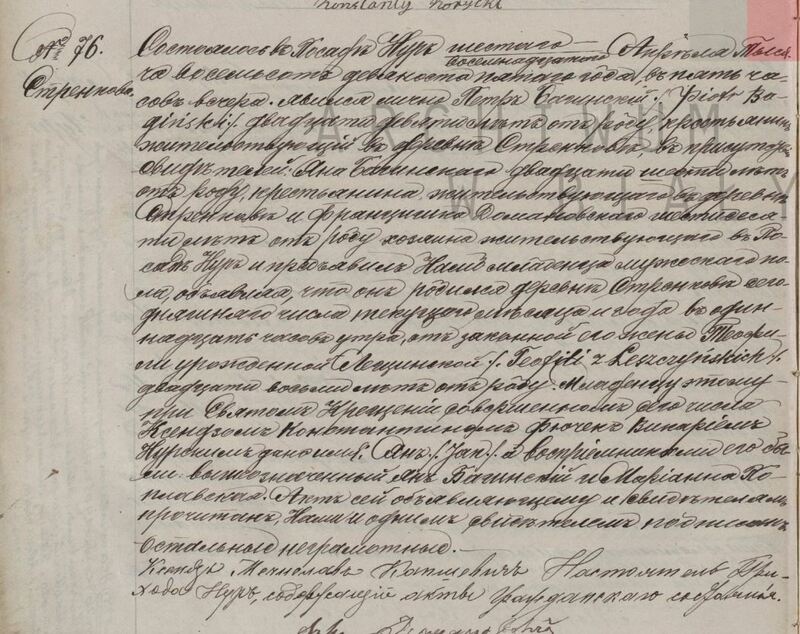 Once it is clear to me which of the Piotrs is my great-grandfather, I will be asking for help in tracing his records. i would like You to decide about the donation. It happened in the city Nur on the 22nd day of May 1864 at 3 p.m. Appeared piotr Bagieński, farmer living in Zebry, 34 years old in the presence of Wojciech Popławski, 38 years old and Franciszek Fieodorczuk, 40 years old, both farmers living in Zebry and presented us a male child informing that the child was born in Zebry on the 20th day of May of the current year ar 5 a.m. with his wife Katarzyna nee Pietrzak, 36 years old. At The Holy Baptism held today by the priest Łukasz Grabowski the child was given the name Piotr and the godparents were: Ignacy Biernacki and Konstancja Murawska. this act was read aloud to the declarant and witnesses and because they are illiterate it was signed by Us. Teofila Leszczyńska, a miss, daughter of spouses: Teofil Leszczyński and Ewa Leszczyńska nee Wojtczuk, daylaborers. Born and living with her parents in Żebry, 18 years old. this marriage was preceded by 3 banns announced in Nur parish church on Sundays on: 22 January/3 February, 29 January/10 February and 5/17 February of the current year. Newlyweds informed they didnt make premarital agreement. Religious marriage ceremony celebrated by Us with permission of parish parson. Newlywed's fathers, present during writing this marriage act, gave oral permission for this marriage. this act was read aloud to the newlyweds, witnesses and newlywed's fathers, all illiterate and signed only by Us. 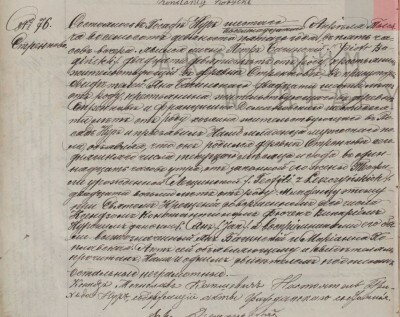 priest Jan Szostakiewicz signature, nur parish vicar, serving as civil registrar. It happened in the city Nur on the 2nd day of July 1829 at 2 p.m. Appeared Antoni Bagieński, farmer, laborer living in the village Ślepowrony Nagórne, 27 years old in the presence of Wojciech Cieślak, 47 years old, farmer and Tomasz Wojtkowski, 33 years old, heir tot eh both parts of the village, both living in the village Ślepowrony Nagórne and presented Us a male child born today in the village Ślepowrony Nagórne at 4 a.m. with his wife Franciszka nee Sienkiewicz, 21 years old. 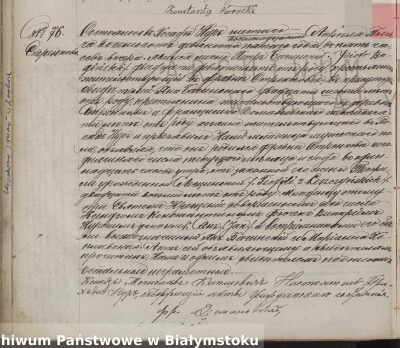 At The Holy Baptism held today the child was given the name Piotr and his godparents were: mentioned above Wojciech Cieślak and Elżbieta Młodzianowska. This act was read aloud to the declarant and witnesses and signed only by us because they are illiterate. It happened in Nur on the 6th/18th day of April 1895 at 5 p.m. Appeared Piotr Bagiński, 29 years old, peasant, living in the village Strękowo in the presence of the witnesses Jan Bagiński, 26 years old, peasant living in the village Strękowo and Franciszek Domanowski, 60 years old, farmer living in Nur and presented Us a male chils informing that the child was born in the village Strękowo today of the current month and year at 11 a.m. with his legal wife Teofila nee Leszczyńska, 28 years ago. At the Holy Baptism held today by the priest Konstanty Fiuczek, Nur parish vicar the child was given the name Jan and the godparents were: mentioned above Jan Bagiński and Marianna popławska. This act was read aloud to the declarant and witnesses and signed by Us and one of the witnesses, the others are illiterate. priest Mieczysław Kapszewicz, Nur parish parson, serving as vicil registrar.